Blue & white china has formed one of the grand luxe objects for collectors since the 16th century, at least, and thus also one of the elements of a still life composed to express opulence wealth (see Juriaen van Steek, Still life with peaches and a lemon, first half 17th century, and Cornelis van Heem, Still life with vegetables and fruit before a garden balustrade, 1658, Stadel, Frankfurt). 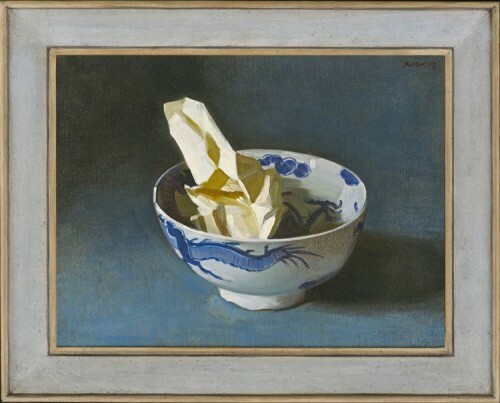 In the 19th century blue & white china was still rare, valuable, and it was a frequent part of still life paintings, supplying the balance of a colour which is rare in natural objects (Anne Feray Mutrie, Still life of primroses, daffodils & a blue & white bowl, Christie’s, 8 November 2009). Stephen Rose’s Dragon bowl is a much starker composition; not part of nature, nor advertising its rarity, it sits in an indefinable space, with a crumpled piece of paper thrown into it. This is the subversion of the 17th century Dutch still life, pared down and minimal, with only the Prussian blue tone of the ground to offset the ultramarine of the bowl, and the subtle evocation of highlight and shade to express the glaze of the porcelain. In consequence it is projected with a powerful sense of presence, realized with every nuance of texture, gloss and eggshell fineness intact.